On 18 September 2014 I posted a piece entitled Colour thesaurus that has attracted a steady flow of hits. 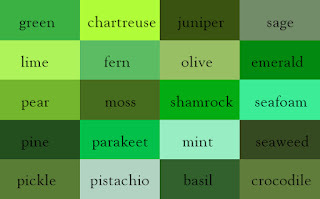 Today's post is about the wonderfully innovative and remarkably simple Color Thesaurus (her spelling) produced by Ingrid Sundberg. The next step for translators is to produce validated equivalents in various languages. Anyone out there feel up to the challenge? Wikipedia page on the distinction between blue and green in various languages.